Hyper Plan v2.8.0 is now available for Windows and Mac. This is a test (beta) release, to allow customers to give feedback on the new 'connections' feature that will be available in Hyper Plan Professional Edition. One of the most requested features for Hyper Plan is the ability to add connections between cards. For example 'A must happen before B' or 'C is related to D'. Hyper Plan can now do this using 'connections'. A connection is shown as a directional arrow between 2 cards. You can define any number of connection types e.g. 'Before', 'Relates to' or 'Comprises'. Each connection type can be shown with a different color, thickness and line style, to make them visually distinct. Connection types can be shown or hidden in the 'Cards' pane. Connections route automatically between cards. This new version has been stable in testing. But as a test release it is a work in progress. So we recommend you copy any important plans before editing them in this test version (you can easily do this using File>Duplicate File... in Hyper Plan). Please try it and let us know what you think! Do I have to uninstall v2.7.0 before I install v2.8.0? No. We recommend you leave v2.7.0 installed, so you can easily revert it if you need to. Can v2.8.0 read plans created by v2.7.0 and earlier? Can v2.7.0 and earlier read plans created by v2.8.0? Yes, but any connections related data will be lost. What sort of feedback can I send? Reports of unexpected behavior or crashes (ideally send us a clear series of steps we can do to reproduce the issue). Screenshots and/or videos can be very helpful. Things you think we could do to improve the new feature. What happens when v2.8.0 expires? There will either be another test version or you will be able to buy an upgrade to Hyper Plan v2 Professional Edition. What happens when the Professional Edition is released? a) Continue using the current product, which will be renamed to Hyper Plan Home Edition. But you won't be able to use the new Professional Edition features, such as connections. b) Pay the price difference between Hyper Plan Home edition and Hyper Plan Professional Edition to upgrade and get the new Professional Edition features. How much will Hyper Plan Professional Edition cost? We haven't finalized things yet. But probably around $80 (US) for a perpetual license for 1 named user. This would make the cost to upgrade from Home Edition to Professional Edition around $40 (US). When will Hyper Plan Professional Edition be for sale? Hopefully October or November, but we make no promises. It's ready when it's ready. Automatically layout cards so that each card appears to the right of all the cards it is connected to by 'before' connections. 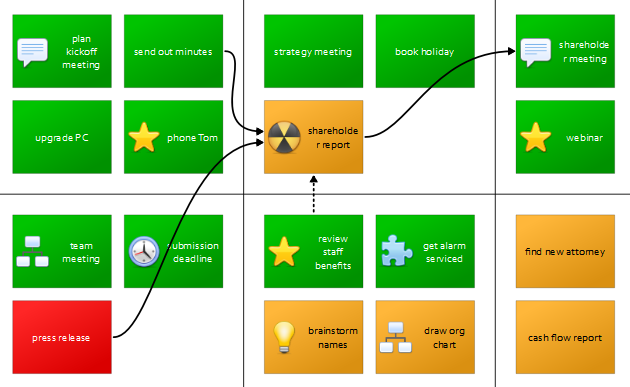 This could be useful for ordering tasks or drawing organization charts and 'swim lane' diagrams. Propagate the values of an 'effort' property up a 'comprises' connection tree to give a total effort for all the sub-tasks at each point in the tree. Propagate the maximum duration of the predecessors along 'before' connection graph to get the time predicted to complete a series of interdependent tasks (similar to a PERT chart). Let us know what you would like to be able to do with connections.